Sony has decided that when it comes to convertible PCs, being able to turn your device into two things just isn't enough anymore - three is the magic number. This is the case with the Sony Vaio Fit. Shown off at IFA 2013, TechRadar has managed to get hands on with the laptop that is hoping to offer a much-needed shot in the arm to the portable computing sector. With Windows 8 currently weighing every manufacturer down, companies are having to come up with clever ideas on how to get people excited about buying laptops again - and, from first impressions, Sony has managed to do just that. The Sony Vaio Fit is a great-looking portable device and is one that can be used three different ways. Sony got the idea for its new fangled folding laptop from the Japanese art of origami, and it does feel a little like trying to make some fold-able magic when you use it. There are three different modes for the device. The first is the tablet mode which needs no introduction - but we will say that the back-lit LED 2880 x 1620 screen looked gorgeous when we played with it. The second is laptop mode. So far so Sony Vaio Duo, but the third mode turns the computer into a viewer. Yes, we know viewer sounds a little vague but this is Sony speak for a mode that lets you show off whatever is on your screen to more than one person. It's a mode that will probably be used more in business areas than anywhere else, but it seems like a good thing to have. The changing from one mode to another wasn't as fiddly as origami can be, but neither was it as beautiful. You have to release the screen before you rotate it into place. It took us a few times to get right but we soon got the hang of it. In fact, we were incredibly impressed with the dexterity of the device and it was only when we put it into tablet mode that we were a tad disappointed. Even though it is an ultrabook, there is still some chunk when you use it as a tablet. It's fine for using around the house but we can't see anyone using this mode out and about. 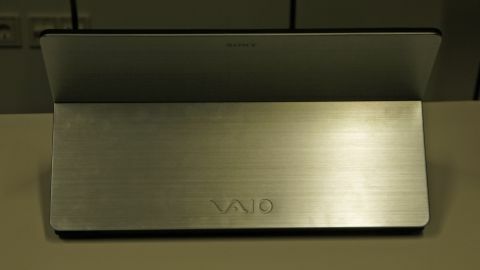 But this is a minor niggle: the Sony Vaio fit is one of the nicest ultrabooks we have ever seen. The fold in the aluminium chassis gives it great character and style. As for underneath the chassis, there is definitely a lot of power. You can have up to an Intel i7 processor with 16GB of RAM and 512SSD storage. And, if you are feeling really fancy, then you can add a Sony stylus to the mix too. There are three versions of the fit: 13-, 14- and 15-inch which proves that Sony is really gunning for the mass market here. With whispers that an 11-inch will also appear soon, this is definitely a device for all and not just those who love a niche. The Sony Vaio Fit release date is this Fall, with pricing to be announced. The Sony Vaio fit is an impressive new category for Sony that offers both consumers and business folks myriad reasons to invest.